His minutes aren’t reported (rude) so it’s hard to get a more accurate representation of his shot-blocking prowess, but Alex Davis averaged out at 1.2 blocks per game, per MaxPreps.com, during three years on the Dwyer (Fla.) High School varsity basketball squad. His senior year, Davis transitioned to football and that’s a move that has taken the 6-foot-5, 255-pound end/backer until now to really get comfortable with (probably didn’t help he started at end then moved to backer). Davis redshirted his first year then appeared in all 13 games as a redshirt freshman. But, he only logged two tackles (both assists) that first year. As a sophomore in 2017, he had 17 total, four for a loss and 1.5 sacks but was getting yanked on and off of the field so much it was hard to really find any consistency. This spring Davis looks to have finally come into his own. In the annual Red-White scrimmage, Davis was everywhere. He had four solo tackles — three of them quote-unquote sacks — and an interception. 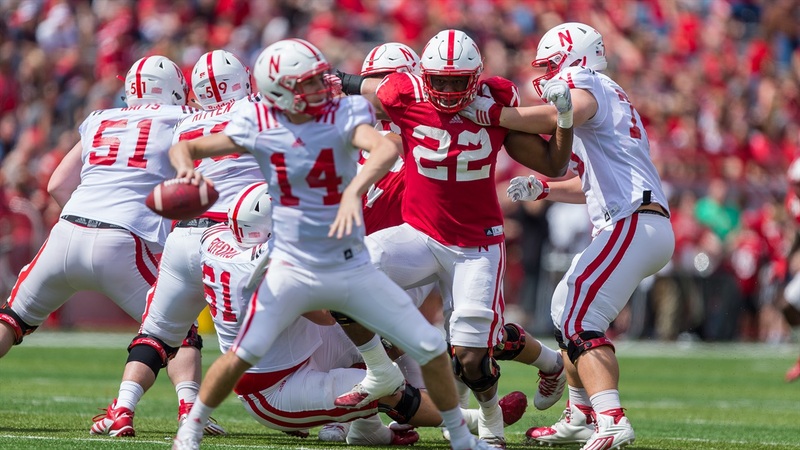 The first sack was very much a product of the scrimmage-type atmosphere; Davis simply reached out and touched quarterback Noah Vedral while getting blocked around him. In a real game, Davis wouldn’t have that one. So, there’s that. But, he showed nice explosion off the ball, so brownie points for him. Let’s also talk about the interception. For one, Vedral, the quarterback who gets credit for the pick shouldn’t have even thrown it. For two, he was touched so the play should have been dead. For three, ignore points one and two because Davis played the coverage perfectly, jumped on the ball with timing that honestly looked pretty natural (it’s almost like he’s had to work on his timing for something else… 1.2 blocks) and then finished the play with soft hands. You could poke holes in that if you want but Davis did what his defensive coordinator, Erik Chinander, desperately wants his defense to do: get the football. His second credited sack was a free-and-clear blitz off the edge that was just a “right call, right time scenario.” Quarterbacks weren’t live, so there’s no way of knowing if Davis would have wrapped up the tackle, but let’s give him the benefit of the doubt on this one. Davis will be a vet in what might be the deepest position group on the entire team. The Huskers have four guys that could realistically grab either starting inside linebacker spot and a handful of guys — Sedrick King, Collin Miller, Tyrin Ferguson — that could grab either outside backer spot away from Davis. And that’s not even including an injured Luke Gifford that will play big snaps if healthy or transfer Breon Dixon that perfectly fits the mold Chinander wants for his outside backer spot and will also see the field often if he gets that eligibility waiver. The football equivalent of a blocked shot feels like it should be a sack. As a basketball player, Davis was a rim protector. During his first outing in Chinander’s new defense, he looked like he could be a backfield wrecker. That is if he’s given the chance. Color me intrigued.